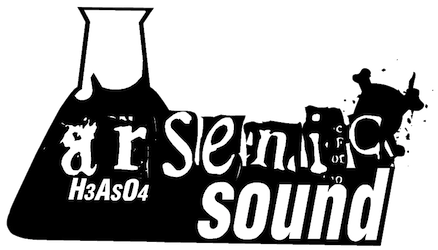 The www.arsenicsound.com web site, is owned by Arsenic Sound srl based in Italy, 40033 Casalecchio di Reno (BO), Via Aldo Moro 11 (hereinafter referred to as “Arsenic Sound”). Arsenic Sound does not collect Personally Identifiable Information about you on www.arsenicsound.com web site, or without your knowledge or action. Personally Identifiable Information is collected only through the Contact Form in our “Contact” section. This information includes the name and e-mail address which you may submit when sending us an e-mail in the Contact section of our web site. Arsenic Sound uses the e-mail address to respond to a one-time request and then immediately deletes both the name and e-mail address. Arsenic Sound recommends that minors 13 years of age or older ask their parents for permission before using the Contact Form which is available in the Contact section of our web site. Non-Personally Identifiable Information includes, but is not limited to, information we automatically collect on your use and/or actions on www.arsenicsound.com web site such as the Internet Protocol addresses of its visitors. We use Internet Protocol addresses to monitor and analyze user traffic patterns, page views, click-through rates, search terms that users enter into our search utility. Furthermore, Non-Personally Identifiable Information helps us determine how the www.arsenicsound.com web site is being used, helps us identify popular areas of www.arsenicsound.com web site, and helps us determine the effectiveness of our promotional activities. In some cases it may be shared with a third party with the only a.m. purpose. The www.arsenicsound.com web site contains links to other Internet web sites. Unless otherwise explicitly stated, we are not responsible for the Privacy practices or the content of such web sites, including such web sites’ use of any Personally Identifiable Information. When you leave the www.arsenicsound.com web site, you should read the Privacy policies of each web site that collects Personally Identifiable Information. You may be able to access certain information and/or services related to third parties, either via links or click-throughs. You understand and agree that your access to or use of such services is a matter entirely between you and the related third parties, therefore Arsenic Sound shall have no liability whatsoever for any such access or use. You understand and agree that it is not possible to ensure complete and total security, especially on the Internet. Any information you may address to this site, including email messages, will not be encrypted unless we advise you otherwise. It is our wish to help you protect your child’s Privacy. We encourage you to talk to your children about safe and responsible use of their Personal Information while using the Internet. In particular, Arsenic Sound does not knowingly collect or solicit Personal Information from anyone under the age of 13. If you are under 13, please do not attempt to send any information about yourself to us, including your name, address, telephone number, or email address. No one under age 13 may provide any Personal Information to or on the www.arsenicsound.com web site. We recommend that minors 13 years of age or older ask their parents for permission before sending any information about themselves to anyone over the Internet. Our web site has been designed with the U.S. Children’s Online Privacy Protection Act (COPPA) in mind and strives to meet all duties and obligations under the rule of law.